Reusable fibertoptic stylet provides safe, bright illumination during intubation. Assures proper placement of the endotracheal tube by effectively illuminating the soft tissues of the neck. Lighted stylets aid in blind intubation by illuminating the soft tissues of the neck. Lighted stylets permit monitoring and correct placement of endotracheal tubes. 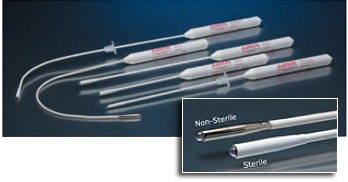 Flexible shafts and a soft protective coating over the bulb housing provide non-traumatic intubations. A one hand activated on/off switch enables easy operation.